During my visit to New Ross last week, I was looking at a number of churches in the town, including the former Saint Michael’s, now a theatre, the Gothic revival Church of Saint Mary and Michael. New Ross traces its story back to Saint Abban, who built a monastery on the banks of the River Barrow in the sixth century. But the town is said to have been founded in 1207 by Strongbow’s daughter Isabella, wife of William le Mareschal, later Earl of Pembroke. Like many mediaeval towns in Ireland, New Ross had a number of monastic foundations, but perhaps the one with the most unusual story is the Priory of the Crutched Friars, who arrived in New Ross around 1210. The Crutched Friars had the right to levy taxes on ships entering the port. But tradition tells of the Friars demanding increased taxes from the town. This led to disputes and in one fight on the quay and on the river, three friars and a townsman were killed or drowned. The enraged people of New Ross then broke into the friary, and the remainder of the friars were run out of town. As the Crutched Friars left New Ross by boat in 1262, the abbot is said to have stood on deck, raised his arms and cursed the town, commanding the Barrow to take three lives each year as a penalty for the deaths of his three friars. He prayed that the town would decay and fall into ruins and that his curse would remain forever. In response to the treatment of the friars, the Pope placed New Ross under interdict, the churches were closed, the sacraments were not administered, and Christian burial was prohibited. This situation did not last long, the site of the Priory of the Crutched Friars was confiscated in 1270, and a new Franciscan friary Roger Bigod, Earl of Norfolk and Lord of the Manor in 1276. New Ross received its first charter from Roger Bigod, Earl of Norfolk and Marshal of England, in the reign of Edward I (1272-1307), providing for the election of a provost of Rossponte or Rosspontum. The town’s privileges were confirmed in successive charters, and the town first elected MPs to the Irish Parliament in 1374. New Ross continued to elect two MPs until the Act of Union, when the number of MPs was reduced to one. 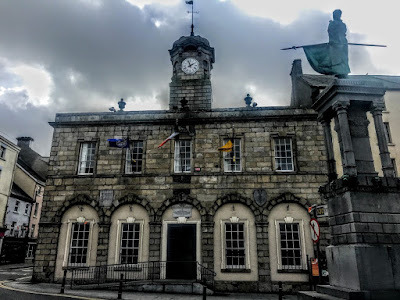 On the dissolution of the monastic houses in 1540, the former friary became the first Town Hall in New Ross. A charter granted by James I became the ruling charter of New Ross. The style of the corporation was ‘the Sovereign and Free Burgesses of New Ross.’ The sovereign or mayor was chosen from among the burgesses. The sovereign and the burgesses elected the new burgesses, who held office for life. The town also had a recorder (judge), two bailiffs, the senior bailiff was known as the Bailiff Receiver, and presided in his own court. During the Confederate and Civil Wars, the Duke of Ormonde laid siege to the town in 1641, but he was driven back with considerable loss and forced to raise the siege. Later, Ormonde defended the town against Cromwell. During these wars, the old bridge was destroyed in 1643, and the river was crossed by a ferry until the end of the 18th century, when a new bridge was built. After the restoration of Charles II, the civic offices in New Ross were monopolised by local lading families, particularly the Tottenham family. Legislation in his reign of Charles II stipulated that elections of the chief magistrate, recorder and town clerk should be approved of by the Lord Lieutenant and Privy Council. The former friary continued to function as the town hall until 1749, when the Tholsel was built. A plaque on the Tholsel noted that the first stone of the building was laid on the anniversary of the ‘glorious Battle of the Boyne’ in 1690. The market house or Tholsel was erected by Charles Tottenham, then Sovereign or mayor of New Ross. The Tholsel was designed by William Kent of London and built on the site of the mediaeval market cross. In the late 18th century, the tidal waters of the Barrow caused the foundations of the Tholsel to subside. The building was taken down stone-by-stone and rebuilt. A date stone records the near-total reconstruction of the market house or Tholsel in 1806 by John Robinson, carpenter and architect. The architectural features of the Tholsel include its compact rectilinear shape, the workmanship on the honey-coloured granite, the windows that diminish in scale on each floor, and the polygonal cupola on the roof which has a parapet topped with urns. The granite ashlar cupola is on an octagonal plan with a rusticated granite ashlar base. The Tholsel has had a variety of uses over almost three centuries. When he ground floor was enclosed in the 1860s, reading rooms were opened, and the upper storey became the town-hall. Opposite the Tholsel, the 1798 monument stands on the corner of North Street and Quay Street. This monument, unveiled in 1907, recalls the rebels ‘who fought and fell in the Battle of Ross’ on 5 June 1798. The bronze figure of a Pikeman unfurling a flag was designed by the Revd Edward A Foran OSA (1866-1938) is said to be either Captain John Kelly (1776-1798) of Killanne, or Matthew Furlong of Raheen, who was shot while carrying a flag of truce. The monument stands on the spot where the Main Guard’s cannon stood and prevented 20,000 rebels from dislodging the defending garrison from the Tholsel in one of the bloodiest battles of 1798. The mace of Edward III (1374), the mace of Charles II (1699), the Charter of James II (1688), and the minutes of New Ross Corporation from the mid-17th century are held in the Tholsel. Today, the Tholsel houses the chambers of the local authorities.